In the summer of 1999 a man from Virginia visited his ailing grandmother in the State of Washington and tended to her during her final days. He then made a long slow sojourn back across the United States to his home. During that journey he informed many of his friends on the internet of his progress by a series of email messages. He called that trip the Thunder Trail. Here are those messages and some more information. We found it interesting. We think you will too. I have enclosed a pic of me. For the most part, it is best to describe me as 1/3 Native American, or American Indian...Cree 1/4 and the rest of the third, Blackfoot. My lineage also goes back to Viking stock...which accounts for the golden hair and red beard when in growth. I am also a little Scot, and some other nationalities. My heart beats dominantly "Red" though I highly honor the other parts of me, they are what I am. I was conceived in love in the mountains of Colorado near the "four corners" area of the US. I am a very in the moment person, so I place little value on personal history. We all are a changing. 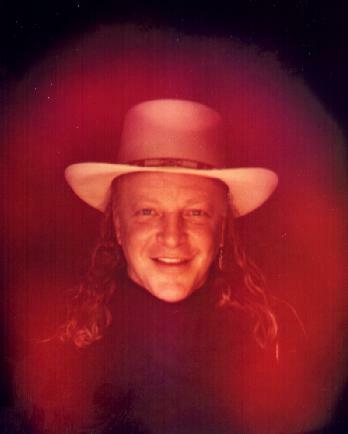 This is one of my favorite pictures, it was taken with a special camera and film designed to include my energy fields at that moment. Recently Grandmother was finally diagnosed with terminal leukemia. This diagnosis does not surprise me. What surprises me is that her health care provider doctors have been drawing her blood for testing on a weekly basis and sometimes several times a week for months and it took them this long to find out what was wrong. This is negligence on their part in my way of thinking since leukemia is a well studied disease. There may have been nothing they could have done to save her, but months ago the chance would have been better. Am I angry?, damn right I am, but this is something I must find a way to accept in grace. I must remember the blessing of having this Grandmother in my life and the many gifts of spirit that have come my way while here this last time. I have watched her be one of the many that have fallen through the cracks in "health care management" programs. If you are not scared of your HMO, you ought to be in this era of "managed care". I have been largely powerless to help her. Someone here has had the power of attorney since they were physically close to her and I feel Jill has done as good a job for Grandmother as possible. I have seen those around her that genuinely love her and tend to her. I have also seen those with other agendas, take advantage of her and even steal from her. These things I could not stop while living on the other shore, but I have put a stop to some of this as best as I have been able while here. I have been only a "little helper" most of the time feeling like not much help. I repair things, bring her things, bring her milkshakes or tacos (she loves Taco Bell), trim her toenails, and rub her back and feet. I also smudge her with the sage, sing to her, and play the native flute for her. Finally there is an end to sticking her, which has been nothing other than a torment to her. Of course, no one is angrier about it than she is. In all this, she has maintained as much dignity as those around her will allow. She is kept heavily medicated now to ease the pain and which affects her memory. Yesterday I was gifted with seeing her much more lively and aware than I have seen her for many days. Grandmother, I am so glad that I spent most of last winter with you while you could still get around pretty good. We did so many things together. We told jokes and laughed a lot. You liked the really colorful jokes the best and I can understand why, they are often reflections of life as it is. We ate out everywhere, drank many a milkshake, went to the beauty parlor (though it didn't do much for me...haha), and you liked to have wore me out shopping. Nobody has the corner on that activity better than you. For all you have given me of yourself I am truly blessed. For guidance on the "Indian" way I am grateful, to have someone who truly loves me to help me on my path spiritual has been special for many would not be so watchful of my safety nor care that I got the right information. You taught me to bead many years ago. I still remember the day vividly and I still feel the energy gifted me of the art and how I felt that energy come into my body. It has been a source of joy, creativity, financial support at times, and a way of gifting beauty into this world. You did not give me many "things" over the years and I am grateful, but I have each and each has special significance for me. I wear the two earrings you gave me with pride and joy very often. 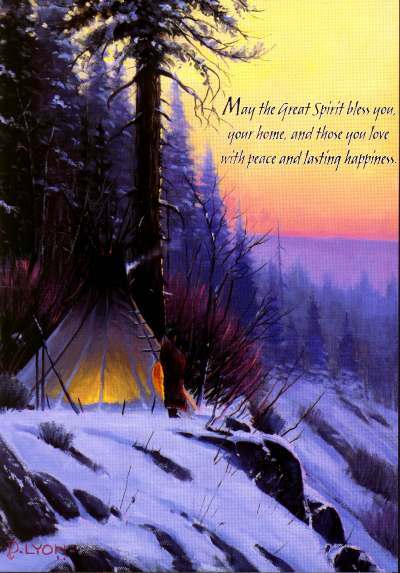 The picture print of the teepee reminds me I will always have home in this world and that the Creator watches over me. The painting of the "dreamer" I love and enjoy often. I light a votive candle under it and it comes alive when it is dark in my room. You returned the Pendleton turtle blanket I gave to you last Christmas because it was too heavy on you and you gifted me the matching capote. I will wear it when in the wild places and think of you. The blanket went to the Sun Dance arbor and I danced on it in the ways of old. It will protect and keep me warm. It is on the bed this moment in my little hotel room. The last thing you have asked me to take is the great bear chair you enjoyed sitting in so much. It will live in Virginia and yes, Grandmother, it will face east. I wish to thank my friend, Stephen McMahan, for "stepping up to the plate" in my behalf and for Grandmother. Stephen is a carrier of the prayer pipe and he carries it well in my opinion. He is the first one to say that he is not a medicine person, just a pipe carrier and Sun dancer. The pipe is ancient and sacred and one of the most powerful ways to pray that I know. Stephen performed the pipe ceremony for her so that she could pray in the way that is right for her, as an Indian. Thank you again for the both of us. This will help her in these days before she "drops her robe" and I have seen that she is more at peace. I hope that to reveal her prayer is not taboo, Creator please read my heart and forgive me if this is not normally done. But in sharing this I give the people a sense of my Grandmother, a feel for who she is and how she stands upon the earth. Short, complete, and eloquent she asked our Creator to help her brave up to this and to make it quick. Grandmother never asked for much that I know of nor did she depend on others where she could avoid it. And even in great sickness and frailty she gave Stephen a blanket for coming to her with the pipe. She was so grateful. I was so proud of her and she walks like an Indian in the way of old, with dignity, grace, and gratitude. A blanket is a traditional type of gift for asking and receiving a favor. I must also say that Stephen came only to help her without any expectations of thanks or gifts, he did what any true pipe carrier would do and that is come to the aid of the people because he was asked. And in all this she gifted Stephen and I with a humorous comment while we smoked cigarettes together. With no malice or ill intent she commented on her state(leukemia) and quipped, "I knew that white blood was gonna do me in.". A loud hoot for you Grandmother. HEY, HEY HO! I thank each and every one of you that have held prayers for my Grandmother and me. I have felt them. I have seen them at work. Blessings to you all. And I thank you for taking me off the humor and more trivial emails, I just haven't had time for them. I thank my cousin, Vickie, for reading the situation and sending a batch anyway on a day when I needed to laugh though I did not feel the energy at first for reading them. I ask you to continue holding other than personal messages to me until I have returned home and rested. I will let you know when I am ready to return to normal. I thank my family back home in Roanoke for their love and being supportive of me. A family that loves you and friends that care for you are a good thing and I am surely blessed with both. Most of all, I am grateful to Creator for my life, for the protection I know always, that my needs are always met, and love. My days here in the Pacific Northwest are almost at and end and I shall soon point the "horses" homeward. Grandmother is out of the hospital and in her beloved home which is good. She feels the safest and the most comfort there. She wanted to be home and was not about to go to the "old folks home". I respect her for that and understand why. There have been good things and joy, but I have been grieving some all along as I realized that I was soon to be without her in this world. This sadness gets me ready. This has been a long 2 1/2 months for me and there is little more I can do. And Grandmother understands that I must go home for that is where my life is and work is to be done there. She says she will miss me and I her. I will know wherever I am when that time has come and for that moment I will celebrate her release. And then after, I will grieve. And when a year has passed I will again celebrate as is the way with us. Maybe me and some of her friends will get together for a dance or a feast after the spirit keeping. She'd like that. For my last few days here I shall be busy making flutes and drums with my friend, Stephen, and visiting Grandmother. When I came out I pretty much tore up the highway to get here, 3,000 miles make for a long drive. Of course, the drive from here to the moon is much longer. I shall take it more gently on the way back. I plan to meander a little, sleeping in a canyon or fishing a good spot. I want to spend a few days in Yellowstone. There are a few other places I must go to take care of a few things. You know, things to do people to see. I thank each of you who are my friends for all the beautiful thoughts, prayers, and energy. May your days be beautiful, filled with joy, health, and love... Aho' mi take' oyasin, (said like, aho me[kinda with a short "i" sound], tahkey, oyasin just like it looks) It means, "to all of my relations. I am in Yakima, Washington this weekend resting at a friend's and taking care of some vehicle business. I threw the lining to a front brake while coming down out of the mountains. I was lucky to find a set of shoes and to put them on so that I could get down out of the mountains. Then I spent part of yesterday replacing both front rotors and putting a new set of pads on the Jeep. It was an easier job on the Jeep than on many vehicles, so I was very grateful for that bonus. I put 3,000 on the vehicle just coming out here, so it is no surprise that with all the miles that I have put on it in 3 months out here that something would show up as needing repair. I really am blessed. Though sad to leave Grandmother, I am glad to be heading home. I completed all tasks in Seattle and have done all I can do. I finished a drum and a couple of flutes that Stephen and I worked on together. Home is where your heart is and so I long to be back home in Roanoke, the place I belong and where I am loved. I do fully agree with author of the "Celestine Prophecy" when he stresses how important it is for us to visit places of beauty. After my time in Seattle, I have longed for the wild places. I needed to fish and to be where the presence of humans is limited so that I could partake of nature within the pristine. I headed north to the Mt. Baker area and spent the night there. It was beautiful, and I took pictures of Baker and Shooksun (which means "rugged"), and some falls nearby that were awesome within this beautiful gorge. It was the perfect spot to visit for closure, it refreshed me, and I even found a sacred spot where another like myself had stopped to pray for they had left sage behind. That touched me in a good way. This particular forest is different than many and a powerful presence resides there. I was amazed to see little sign of wildlife, though I have come to be aware that you will often see signs in places you didn't expect and not see it where you feel you should find it. But I did decide to go into the wild spot at night to look up at the stars, to center, and to breathe. I was outside the Jeep taking it all in where it is remote and dark when I felt a presence very powerful. I felt quite vulnerable all of a sudden as this "presence" felt neither animal nor human. It felt localized and within the spirit of the area, I felt watched. I have been described as silent in movement, but this thing that moved was alien to me yet fully natural to the surrounding and much more silent. "Chicken Little" was back in that Jeep in a heart beat very glad that I did not meet whatever it was in the dark. My friend Dan from Sun Dance described his similar feeling as nervous, I knew he meant scary, and folks-I was definitely scared. I have spent a lot of time in the woods feeling quite comfortable, and this was not one of those times. I went back to the lodge/motel and watched movies and did laundry, which is good cause I was just a few clicks shy of being naked. The next day I took some more pictures as I wandered through the area and then as the evening approached I moved on to a little wide spot in the road south of the Mt. Baker area, called Concrete. Guess I needed something familiar and urban, actually it was a nice place to sleep for the night. From there, I fished a couple of places and then headed through the upper Cascades. They are called the American Alps and they are beautiful. The Columbia River runs through a major gorge with several dams along the way. I made it through to a quaint little place called Winthrop and stayed for the night in the nicest Best Western I have stayed in called the Cascades Inn. The next morning I made my trail through the mountains stopping many places to fish for a few minutes. I found one major hot spot for fishing just on the south side of Carlton. Boy, did I have fun. In a half hour I caught eight rainbow trout that were all keepers though I released them. I was so pleased and blessed to have found that little sweet spot and to have had such great fun. Not one was under 12 inches. I got some great pictures of that region on the way to the Grand Coulee Dam. It is the second largest dam next to Hoover, but has the distinction of the most concrete of any structure in the world. It was an awesome site, for a dam that is. I had a bite to eat and then headed back up the road where I came from to camp out in an open spot suitable for star gazing and to take a more scenic route to the Wanatche River area. Several miles up the road and in the night I threw the brake shoe. No different than a hundred years ago, "horses" throw shoes. I limped along to the spot I had seen and shut it down for the night. The stars were awesome though there was more light interference that I thought there would be. It is getting so that it is very hard to find dark skies for viewing the stars. The next morning I stowed my gear and headed toward the forest I have loved, looking for a parts house along the way. I had breakfast in Mansfield and not only was there no parts, but there was no place to do the job. Another forty miles down the road I struck "pay dirt" and got the brake shoes in Waterville. I was able to work on the Jeep at a little used car lot close to the Napa parts store which closes for lunch an hour every day. Were I had met with suspicion and unfriendliness in Madison, I met with smiles and help here. In my travels I have seen much of this, especially in this region of the country. Every place is different and I am lucky for the most part. Each place has its "color" and Seattle first gives the impression of friendliness, and that is true until you realize it is only at the surface and close to the surface. Must have something to do with being a big city, though I do find good people every where. Anyhow, the guys at the car lot set me up with an air jack and one key T-45 star socket without which I could have never done the job. I got the shoes on and thanked my "angels" at the car lot. I was on the road again. The new shoes came just in time for just out of Waterville I came to the route out of the high wheat field country. It was a winding canyon road with a 6+ grade and I would have been in real trouble if it hadn't been for my good fortune. I made it down through the canyon, grabbed a bite to eat by the Wanatche River and took a few more pictures. I wanted to fish, but daylight was limited and I needed to get out of the mountains before nightfall as I like to avoid wildlife on the roadway. I made it to Yakima safely and enjoyed an evening visit with my friends and a good nights rest. And then the repairs went well. I am going to push onward tomorrow though I will stop in one place I was told was hot for fishing on the way. I am grateful for this resting place and for my friend Susan, and her family. I have known them for several years and they have always been very nice to me. Susan is a classic. And her Mom is a love and also classic of the western personality. You know, self reliant, loving, trusting to an appropriate degree, hard working, focused to family, and very joyous and grateful. Earlier in the summer they had a family dinner gathering on the lawn and sat with Mary and we laughed and talked up a storm. I showed and played my flutes for everyone and you would have thought I was family. Susan, tell your Mom I love her. One other thing among the many that I like about Susan is that she has great manners and introduces me to everyone that we meet no matter how trivial the connection. This is a quality I will cultivate for it honors all and is a good thing. I thank you Susan, Doug, John, and Sid for the hospitality and love. Tonight we had a cookout and Doug cooks a good steak. It was good eating and fun. Fare well, my family in Yakima. I have to check out one more thing on the Jeep and then I will be heading east, probably stopping in Couer d'Alene, Idaho and maybe I will push along as far as St. Regis or Missoula, Montana. It depends on how early I can get out. I do have a planned fishing spot to check on the way out. I do not know exactly the route I will take from there. There are two favorite places that I love in this region. I do know that I am going back through Yellowstone. But there is also Glazier International Peace Park which is beautiful and I have seen a couple of times before. Like Yellowstone, it is new each time especially if there has been a few years between visits. I will have to consider the weather, because the fall is definitely beginning to show and in the wild spaces weather can change rapidly and you can see snow rather unexpectedly. I am not outfitted for extremes at the moment, though I have seen more snow in the mountainous areas from last winter than all the snow I saw last winter, though I now remember I was in Texas and Seattle most of last winter. It appeared that Mt. Baker still had snow as deep as 20 feet up near the summit from its world record snows this last winter. In fact I either heard a blast go off or what sounded more like an avalanche on the other side of the mountain. Freaky isn't it. I did not hear the distinct sound dynamite, but more a crack and rumbling. Wow, seems as if I have hardly been home much of this year. No wonder I am homesick at moments. Grandmother Donna Paul Kalvin, "dropped her robe" in the early hours of Monday, September 27th 1999. She went peacefully in her sleep and the "Grandfathers" had visited her before going, I guess to give her a "roadmap" to the next place. I was especially glad for that and to know that the prayers before the pipe were answered just as they were made. Thank all of you for your prayers for her and me. I have known moments of sadness which is to be expected, but I am glad for her and the end to suffering. I happened to be near the sacred place called, Bear Butte in South Dakota when I received the news. It was perfect. I went to the sacred mountain to pray and to sing songs for her, she always liked me to sing songs for her. I left prayer ties in the trees on that sacred ground for different purposes. I could feel the awesome power there and lost all track of time. Nothing happens by accident in this universe and my journey took me the next day to the Pine Ridge to visit a woman elder of the tribe. I arrived after dark and after a little visit we headed upon a back road journey to a wake. I wasn't expecting that turn of events, but it turned out to be the perfect thing for me. To meet with other people in sorrow and be fully present with them was a healing for me. And the ceremony was beautiful. I can remember their faces, and how much passed in the quiet of a long hand shake with one man and the woman that cried in my arms for her loved one. There was a mixture of deep sorrow and joy which I understood quite well. And there was a traditional feast which brought me a sublime gift. As I silently ate in the company of elders a sense of joy came over me for I realized my Grandmother was right there with me and inwardly we giggled together. On the way to that place of letting go, I was gifted the sight of one of the most awesome lightning displays. The Thunder beings were very busy and I have never seen anything like it, so many different forms of lightning which told me there was something important afoot. Before I laid down for sleep in the middle of the night, the sky cleared to reveal the stars and while alone giving thanks a spectacular meteor streaked across the sky. I left the Pine Ridge very grateful for life as it is, received invitations to return, and expressed my gratitude to my kind hosts. I have been traveling with the expressed purpose of seeing the beauty of this wonderful land and to contemplate the lessons that have come to me. I have seen more of this country than most folks and yet with all the new sites I realize how much more is to be explored. That will have to wait for another time for now I have the rest of this journey homeward with a few more planned stops. There is purpose to this time. This is a time to contemplate lessons and gifts, to renew myself with beauty, to contact a few people, and to savor the joy of going home. I have been very alone out here on this road and there are moments that I feel totally alone in this world. It is in these moments you appreciate that you have good friends and family, and I have missed my family back home and my bed. I accepted this journey knowing that I would have to stand alone in moments, though I was never truly alone for the Creator has been there for me in every step. And I have had all of you with me in ways which I have felt. But this time is like a cleansing or better yet, like standing at a "crossroads" and the good news is that I am led to take a good road. The road led me to a lake this evening, and I fished that little lake with not a human soul for miles around. There were plenty of wild things around. I will catch you guys up on the details of my trip up to this point another time. Maybe I will design a web site where you can see pictures of some of the places I have been. And the wildlife I have been very close to. I am near Wind Cave, S. Dakota this night. I saw the cave today and one of the largest herds of buffalo yet. I even snapped a shot of two pronghorn deer moving through the herd. I will stop by Mt. Rushmore tomorrow while heading for northeast Nebraska for a meeting. From there I will map the rest of my journey homeward pretty much in the way I have gone until now, willing to be guided. I appreciate all of you and hope you will bear with me after I have returned home. I will be staying somewhat inward for a while. So I ask you to hold off on everything other than personal messages. I will need rest and I plan to take in some simple pleasures when I return home such as fishing my sweet spot in the mountains. And I hope my brother, Ed, will take a canoe fishing trip with me on the Craig if he can manage the time. I have a garden to till and plant in winter rye, I call it putting the garden to bed. I have chores to catch up on and prep for the winter. I have tobacco to cure and a shop to clean out so the shop will be in order. I am ready to bring some more flutes into being. I look for the laughter found in home, the evening fires, sleeping in my bed, making plans for the future present moments to be, yes, all the simple sweet pleasures of home. And I will be in my quiet mode while reviewing this "passage" in my life. Hello everyone! I hope you are well. Tonight I am in central Minnesota a few miles north of Brainerd. I am visiting Alex and his mom, Judi who have been friends of mine for years. It is good to see your long standing friends, though when the visitation is short it is a challenge to catch up on all that has transpired in your lives. We do a good job anyway. I had been on the Pine Ridge in South Dakota visiting an elder there and then went north towards Rapid City to catch the big highway for I did not want to travel the back roads across S. Dakota or Nebraska to my next destination. I had in mind seeing a few of the sites along the way such as Wind Cave and Mammoth outside of Hot Springs, SD, the Black Hills, the Crazy Horse Monument, Mt. Rushmore. I saw most of what I wanted to see along with herds of buffalo near Wind Cave. The Crazy Horse Monument is in progress and though quite "kewl" it is soon to be a tourist trap. But I thought that such a monument was much more fitting in its particular locale than Mt. Rushmore. When you see Rushmore it is easy to appreciate the engineering challenge of the era to chisel these huge sculptures in granite and I understand why it was a vision. But I honestly have to say it is also the height of vanity to put the "white" president's images in stone right in the middle of sacred land which was stolen from the Indian people for gold and other resources. So I traveled and got blown all over the road for miles across S. Dakota to my next stop in northeast Nebraska in order to visit a venerable old man and elder of the Sioux. I went there for counsel, but as is often the case, what we go in one direction for is not the true reason we are sent. When I got there, it turned out that they were remodeling a house to move to before the winter comes. There had been a flood earlier in the year which contaminated all the wells in the area and they had to move. This elder is 78, and he and his wife with a small handful of 3 helpers are trying make an old house habitable before the winter snows. And since this man holds a special place among his people he also has a sun dance arbor and ceremonial house to move. There is a lot to do. So my need/desire took a "back seat" and so it was an opportunity for me. So a little help with supplies and a few days applying my construction skills turned out to be the reason I was sent. I wish I had known earlier that this was the reason, for I would have chosen to forgo a few of my stops to be there. It is good, and I have been invited back. We can talk another time. But now I send out a call....for help from anyone who might be able to help finance some of the needs or donate skill and labor. Financially, at a collective level we might be able to be of service....just a little from everyone could help. And maybe some able bodies might be available be able to show up...I am concerned for them. So if you desire to help in any way, contact me. I traveled northeast towards Minneapolis to visit my friends and I went to Pipestone, Minnesota to put down prayers there and to see the famed spot. The Indian people use the sacred red stone to carve the prayer pipes and have for centuries. Hahaha....teasing Judi. It is a beautiful area and I laid my tobacco offering with the "three maidens" and went to see the area. I received gifts while there. (yes, Stephen, just what you think). I asked for a sign that would be too obvious so that I would know what I needed to know. From there I went to Minneapolis and then north to Pelican Lake. This Minnesota has a lot of lakes. For you other states out there short in the lake department, Minnesota has them. It is pretty here though quite flat to me after where I have been. Regrettably, my time here will be short. I must get home. I am 2 weeks behind schedule now and will be 3 weeks behind my original thought about getting home by the time I get there. I am expected home by my birthday which is the 22nd and in order to avoid being "dead meat" I guess I had better get there. The family looking forward to my return and after all, I missed Thanksgiving and Christmas this last year. And all though my purpose for being away was understood, I was still reminded of it...hahahaha. So off tomorrow I go. Y'all take care now....love to you and thanks for the prayers. I am home now. I made it in early the morning 2AM of Wed. Oct. 20th. I stopped at my sacred lookout place and dropped the tobacco prayers of gratitude that I am home again, safe and sound. It is good to be home and to see my family again. The road was a good road for which I am grateful. The great sweetness for me right now is being home. We all have had the pleasure to awake in our own beds after a journey, but after 4 months it is a supreme joy. I am catching up on my rest and rejuvenation, going to dreamland early Wednesday evening and sleeping off and on Thursday. I even missed my pre-birthday celebration this evening by sleeping through dinner until midnight. But the cake at midnight was really good, a simple brown on brown chocolate cake that Carolyn baked for me. Birthday cake in bed, they say "it doesn't get any better than this" and if it does I want to know what that is. (hahaha)In a few hours it will be my birthday and I plan to return to sleep in a few minutes so that I can be ready to celebrate all my blessings and to vision for the future. For all of you that have been "with" me on the road, I thank you for your prayers for my Grandmother and me. She visits me often enough and that is good. I have felt the support coming to me on the road to sustain me. Some of you who know me well have understood this journey, the greater import of what I had to do. I thank you all. I have so much to catch up on. so hold off on the humor messages, I prefer to invest my time catching up on things at home and reliving my recent experience. If you have personal things to share, please write. Take care, and be wonderful, healthy, full of joy, in gratitude for all things, and at peace. Aho! Mitake Oyasin. mountains of Colorado. Thanks, Dad! Back to our travels, visitors, and activities. Last revised May 12, 2012. All contents copyright (C) 2012, Duane Bristow. All rights reserved.